So, you’ve just re-located to the Lake Norman or Charlotte area, or you’re still considering it…but who can afford the lavish lifestyle of living front and center on the lake? Or maybe you prefer a city or suburbia lifestyle, but still want to take advantage of the awesome benefit of having such a beautiful lake so close by. After all it’s a waste to live in a lake town and never actually get out on the lake! Luckily, there are multiple points of access around town weather you’re looking for boating, fishing, swimming, beaching, or just simply enjoying the shimmering view. If you enjoy hiking, there are plenty of mountains and trails that overlook the water, enriching your journey even more. 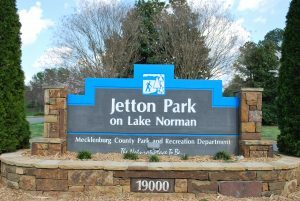 Jetton Park is one of the favorite spots for locals to experience the lake, totaling 104 acres filled with beach areas, picnic decks, concession stands open in the warm season, playgrounds, tennis courts, a 1.3 mile bike trail and a 1.5 mile walking trail, and a waterfront hall available to reserve for events. Unfortunately swimming is not permitted in the lake at this park, but there are plenty of other activities for the family, kids, and dogs. Lake Norman State Park is a large national park with access areas to Lake Norman, and is one of the two parks in the region that allow swimming in the lake. Fishing is also permitted and there are plenty of areas to set up where you won’t be crowded by others doing the same. With 30.5 miles of single-track trails, Lake Norman State Park is a popular destination for the bikers in the community. The park has a 125 yard sand beach and offers a boathouse as well as boat ramps. Dragonfly Trail is the kid-friendly, easy walking trail just adjacent to the State Park Visitor Center, where you can find exhibits on the animals you’ll find throughout the park as well as some historical exhibits. Camping is available during warm-weather months and a community building with a fireplace can be rented during the Winter months. 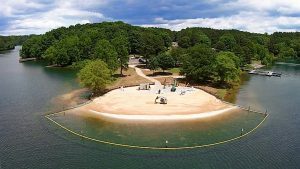 Ramsey Creek Park is one of the newest Lake Norman access parks in the area, and is spread across 46 acres. This is the only other park in the area that allows swimming in the lake, and has a lifeguard on duty during beach hours. In addition, there are docks and boat launch areas provided for patrons to use. Fishing is permitted with use of the piers in place. Bring the family in the Summer for an all-encompassing experience on the lake with picnic shelters, swimming, boating, fishing, nature trails, a volleyball court, and even an enclosed dog park area. A free shuttle bus is provided to the park from Northcross Park and Ride on weekends and holidays seasonally. 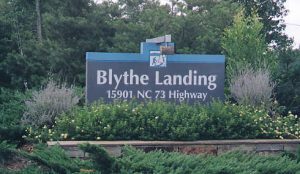 Blythe Landing Park is a slightly smaller park with lake access located in Mecklenburg County, featuring 26 acres and six public boat launches and floating piers. A unique feature of Blythe Landing is the Dockside (Sunshine) Cafe by Armin’s Catering, serving sandwiches, snack foods and drinks for those looking to grab a small bite before getting out on the boat. There’s even a small outdoor patio for eating your lunch with a lake view. Blythe Landing includes picnic tables, playgrounds, and sand volleyball courts.